In a recent article I described in detail various attributes of boron in reef aquaria.1 These attributes include providing pH stability and the potential for toxicity from excessive boron. One of the issues with boron is that it provides alkalinity that is detected by standard alkalinity test kits,2 but that is not directly beneficial to organisms for calcification.3 Consequently, if boron levels are higher than in natural seawater, the interpretation of total alkalinity tests as carbonate alkalinity is confounded. Since carbonate alkalinity is one of the most important water parameters in maintaining reef aquaria, knowing that the boron levels are not causing interference in alkalinity tests is important. Towards this end, Seachem has developed a borate alkalinity test kit. It is actually called the Magnesium and Carbonate/Borate Alkalinity kit. A description of the kit, and the directions for using it, are available on the Seachem web site. In addition to allowing determination of borate alkalinity, it also permits determination of total alkalinity and magnesium (though I don’t understand why these are packaged together). Carbonate alkalinity is determined by subtracting the borate alkalinity from the total alkalinity. The kit costs about $26 by mail order and claims to be able to perform 75 tests. This kit could be especially important to users of Seachem salt mix with its high levels of boron,4 enabling them to use this salt and still be able to determine the carbonate alkalinity. In this article I will review how well this test kit accomplishes the rather difficult task of determining borate alkalinity against a background of carbonate alkalinity. In natural seawater, boron is present at about 0.41 mM (4.4 ppm total boron) and takes two different chemical forms.5 The predominate form is boric acid, comprising about 70% of the total boron present, though this figure varies as a function of pH (Table 1). The second form is borate, B(OH)4-. It carries a net negative charge, while boric acid is neutral. These two forms can interconvert rapidly, so the two forms are in chemical equilibrium with each other. Table 1. The fraction of the boron present in the two forms as a function of pH. The right hand column shows the contribution to total alkalinity provided by the borate when boron is at natural levels. It is, in fact, the conversion of borate to boric acid that provides “borate alkalinity”. Specifically, as the pH is lowered (as during an alkalinity titration), the equilibrium shown in equation (1) is shifted to the left. As borate is converted into boric acid, acid (H+) is consumed. Since one equivalent of acid is consumed for each equivalent of borate present, the borate alkalinity is equal to the concentration of borate in the solution. Boric acid itself does not contribute to alkalinity. When determining total alkalinity, this borate alkalinity (equation 1) contributes the total alkalinity just as the conversion of carbonate to bicarbonate (equation 2) and bicarbonate to carbonic acid (equation 3) contribute . Hence the borate confounds the determination of carbonate alkalinity using a total alkalinity test kit. and B is the total concentration of boron species (0.41 mM for natural seawater). Table 1 shows the expected contribution to the total alkalinity of seawater from borate using equation 4. In the pH range experienced in normal reef aquaria, (say, pH 7.8 to 8.6), this contribution ranges from about 0.1 to 0.25 meq/L compared to about 2.5 meq/L for the total alkalinity. Consequently, the borate contribution is fairly small, and is not enough to concern aquarists who have levels of boron that match natural seawater. In some instances, however, the total amount of boron may be much higher than seawater. More than ten times normal levels in some cases. When boron is that high, then the borate alkalinity becomes very significant, at 1-2 meq/L, and can readily mislead aquarists interested in carbonate alkalinity. Later in this article I’ll discuss how the Seachem borate alkalinity kit actually permits determination of borate alkalinity. Before that, however, I will describe the test kit, and then show how well it actually determines borate alkalinity. In practice, this test kit is quite simple to use. A water sample is measured out with a measuring vial, and something called a “borate alkalinity precipitant” is added. What is precipitating is probably a carbonate salt, and possibly some sulfate salts as well. In any case, you add 2 drops of the precipitant and wait 5 minutes. I got similar results when I waited 30 minutes in one test. After 5 minutes, the aquarist adds one drop of an indicating dye in methanol. While it looks functionally like other alkalinity kit indicators, it has a different endpoint (pH 6 according to the kit). This difference is important for the function of the kit. Don’t use this indicator for normal alkalinity determinations because you will come up far short of the actual total alkalinity if you use it (normal total alkalinity has an endpoint around pH 4). After adding the indicator, the solution is slightly blue. The aquarist then adds dilute sulfuric acid from a syringe until the indicator turns yellow. That sounds very simple, but in practice it can be difficult to see the color change when there is a lot of precipitate. Samples with higher total alkalinity seem to have more precipitate, and are harder to recognize the endpoint. I’d suggest putting a pH probe into the water, and titrate to pH 6 instead of the color change endpoint. That gives a much clearer stopping point for the titration. On final comment. While the syringe is calibrated to permit a precision of about 0.1 meq/L in the borate determination, the actual drops that come off of the syringe amount to about 0.3-0.4 meq/L/drop. So the practical resolution is limited to about +/- 0.3 meq/L unless one does something special to the drops to get them to fall off when smaller. Compared to a normal borate alkalinity in natural seawater of about 0.1-0.2 meq/L (Table 1), 0.3 meq/L is not very good precision. The directions claim that you can get better precision using a larger sample volume, and I expect that is true, though it then cuts down on the number of tests per kit. In order to assess the accuracy of this test kit, I made several standard test samples. One consisted of Instant Ocean salt mix made to a salinity of 35 ppt (measured via conductivity to be 53 mS/cm). A second sample consisted of water from my aquarium, also at a salinity of 35 ppt (also measured via conductivity). In both of these cases, I determined the amount of boron present by ICP (Inductively Coupled Plasma) using the method of standard additions, with additions of 4.8 and 9.1 ppm boron using a commercial boron standard.. Both samples had boron elevated over natural levels (4.4 ppm; 0.41 mM). The sample from my aquarium had 0.67 mM (7.2 ppm boron). The Instant Ocean sample had 0.75 mM (8.1 ppm boron). I also performed a total alkalinity titration on both of these samples by adding measured amounts of 0.0993 N sulfuric acid to an endpoint of pH 4.2 (using a calibrated pH meter and using 200 mL of sample). Finally, I took the Instant Ocean sample and spiked it with borax (sodium borate decahydrate) to a total of 10 mM (108 ppm boron) to get a very high borate concentration standard. I then determined the total and borate alkalinity using the Seachem test kit. The results are shown in Table 2. The “actual” borate alkalinity was calculated for each of these samples using the known boron concentration and equation 4. The total alkalinity portion of this test kit performed quite well. It matched the total alkalinity of the samples to within the precision of the kit. It is not the intent of this article to review that attribute of the kit, but nevertheless, it appears perfectly acceptable for normal reef keeping activity. The borate alkalinity portion of the kit did not perform quite as well. The results are shown as a range because it was not always clear exactly where the color change endpoint was. Each test was run several times on several different days, and the results were quite reproducible. In most cases, I confirmed the actual endpoint (pH 6) with a pH meter. 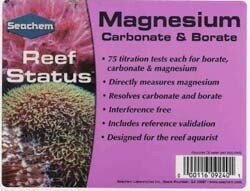 For example, the aquarium sample is reported to have a borate alkalinity of 0.4-0.8 meq/L. The pH of one particular sample was 6.24 when the equivalent of 0.4 meq/L had been added, and 5.98 after 0.8 meq/L had been added, suggesting that the 0.8 meq/L figure was essentially correct for that particular sample. In one test, I waited for 30 minutes after adding the precipitant instead of the recommended 5 minutes. The hope was that perhaps not all of the precipitation is done in 5 minutes. In fact, much of it seems to happen when the indicator itself is added, perhaps because of the methanol in the indicator that will reduce the solubility of inorganic ions. Nevertheless, I got the same results for the two samples tested this way (0.8 – 1 meq/L for the aquarium sample and 1 meq/L for the Instant Ocean sample) as when tested using the standard 5 minute waiting period. In general, this kit seems to overestimate the borate alkalinity in what I call “normal” samples. Most importantly, aquarists with a reading of 1 meq/L borate alkalinity should not make the mistake of thinking that they actually have that high of borate alkalinity. If they were to believe that to be true, they might raise their carbonate alkalinity too high in response. For example, if your target was to have 3 meq/L carbonate alkalinity in your aquarium, and this kit told you that you had 1 meq/L borate alkalinity, then you might try to drive the total alkalinity to 4 meq/L. In reality the carbonate alkalinity might be nearly 4 meq/L. While that isn’t likely to be a serious issue for most aquarists, it is certainly not helpful. The kit does seem to respond to more borate in the sample with a higher reported borate alkalinity. The high borate standard, with a known 4.2 meq/L borate alkalinity read as 3.5 meq/L borate alkalinity (in this case the endpoint was verified by pH, with 3.5 meq/l giving a pH of 6.08 and 3.7 meq/l giving a pH of 5.7). That’s not too bad if the purpose of the kit is to warn you when a significant portion of the total alkalinity is borate, but it is far enough off to not be especially useful. If you are using Seachem salt mix, with a borate alkalinity on the order of 1-2 meq/L, this kit may be able to help you understand how much of your alkalinity comes from borate. However, that information may not allow for very accurate control of carbonate alkalinity. Measuring Borate Alkalinity : How Does Seachem Do It? The next two sections are designed for aquarists with enough interest in chemistry that they are interested in how a kit might actually distinguish borate alkalinity from carbonate and bicarbonate alkalinity. I do not have any information from Seachem, so some is fact and some is speculation, but it is all intended to provide chemical insight rather than improve aquarium husbandry. If you aren’t interested in the inner workings of this kit, just skip on down to the conclusions. The question facing a chemist designing a borate alkalinity test kit is to determine how to measure the borate alkalinity when there is typically a larger amount of carbonate alkalinity already present (due to carbonate and bicarbonate). One thing that helps is to look at a different endpoint. That is, to add the acid until the pH reflects the consumption of borate, but not other contributors (bicarbonate especially). The alkalinity due to borate comes about as the pH drops from the sample pH to about pH 6-7, where it is mostly converted into boric acid (Table 1). Little additional borate alkalinity is found by continuing the standard alkalinity determination down to the usual endpoint of about pH 4. Less than 9% of the total borate alkalinity is not detected using an endpoint of pH 7, and less than 1% of the total borate alkalinity is not detected using an endpoint of pH 6. The Seachem kit uses a pH of 6 for the endpoint of this titration. Fortunately for kit designers, most of the alkalinity in normal seawater is due to bicarbonate, and most of that alkalinity is found as the pH is carried from 7 down to 4. So much of that contribution can be removed by using a higher endpoint. Using an endpoint of pH 7 would remove 93% of the bicarbonate alkalinity from the determination. Using an endpoint of pH 6 removes 41% of bicarbonate alkalinity. Consequently, moving the endpoint up from pH 4 to pH 6-7 helps eliminate some of the bicarbonate alkalinity from the measurement. Unfortunately, the contribution from carbonate is harder to eliminate because it largely overlaps the region where borate has its contribution to alkalinity. Using an endpoint of 6 or 7 retains all of the contribution to alkalinity from carbonate. Consequently, changing the endpoint up to pH 6 or 7 from the usual pH 4 used in alkalinity test kits is beneficial in reducing the interference from carbonate and bicarbonate, but it does not eliminate the problem. While the aquarium water sample fits the data, there is clearly more to the test than just lowering the endpoint as evidenced by the results obtained for the Instant Ocean sample. Another way to eliminate the background of alkalinity due to carbonate and bicarbonate from the sample is to remove these ions from solution. The Seachem kit appears to take the route of adding a solution that contains a large amount of strontium (at least that’s my conclusion based on ICP analysis of the “borate alkalinity precipitant” which contains a large amount of strontium (on the order of 18% by weight); it could contain other things too). This precipitation is easily verified by adding excess strontium chloride to seawater. The pH drops as SrCO3 is precipitated from solution. In the case the this kit, the pH drop on addition of the precipitant (about 0.2 pH units) is smaller than what I get by adding a large amount of strontium to aquarium water (dropping the pH all the way to 6), so perhaps this reaction is inhibited or controlled by other ingredients in the precipitant. Such soluble complexes can hold onto the bicarbonate and carbonate and make them harder to detect with a pH titration. In other words, they reduce the pKa. The strontium may also precipitate sulfate, as the minerals celestine of celestite (SrSO4), so some or all of the precipitate that forms may actually be strontium sulfate. Nevertheless, if the strontium takes these ions out of play by forming insoluble precipitates or complexes that don’t come apart at an endpoint of pH 6, then they have been removed from the alkalinity determination. The Seachem borate alkalinity kit attempts to perform a very difficult task: that of determining the borate alkalinity of marine aquarium samples in the presence of a background of bicarbonate and carbonate alkalinity. Unfortunately, in my hands it falls short of providing accurate and useful values to aquarists. If you do choose to use it, I’d suggest using a pH meter to get the true pH 6 endpoint instead of trying to see the color in a solution that is very turbid. In the future, I will be testing the Salifert boron test kit to see if it can provide an alternative, and hopefully more accurate way to get at boron and borate alkalinity. In the meantime… Happy Reefing! Aquatic Chemistry Concepts. Pankow, J. F. (1991), 712 pp. Publisher: Lewis Publishers, Inc.
Dissolution of aragonite-strontianite solid solutions in nonstoichiometric Sr(HCO3)2-Ca(HCO3)2-CO2-H2O solutions. Plummer, L. N.; Busenberg, E.; Glynn, P. D.; Blum, A. E. U.S. Geol. Surv., Reston, VA, USA. Geochimica et Cosmochimica Acta (1992), 56(8), 3045-72. Determination of the stability constants of bicarbonate and carbonate complexes using strontium-85. Nilsson, Karen; Jensen, B. Skytte. Chem. Dep., Risoe Natl. Lab., Roskilde, Den. European Applied Research Reports, Nuclear Science and Technology Section (1982), 4(2), 535-60. Bicarbonate complexes of barium and strontium. Nakayama, Francis Shigeru; Rasnick, B. A. U. S. Water Conserv. Lab., Phoenix, AZ, USA. Journal of Inorganic and Nuclear Chemistry (1969), 31(11), 3491-4.